Pong is now almost 5 months old....and last time we checked his weight (approx 2-3 weeks ago), he was 41lbs. I was wondering how big will he get as an adult....so my question is, how much does your chow weight? It will be very helpful if you have a puppy and just to share his weight also...just to make sure pong is ok ...not too fat/skinny. My purebred girl is 45 lbs. And my mix boy is 100lbs. ~lol~ I know your boy won't weigh that much. Ashley & Chow babies, Tucker & Penny! Yours sound find as long as you keep them healthy. As they get older you don't want excess weight, especially if they are not fit as the excess plays havoc with joints. FengHuang just started jumping, down cliffs onto ice flows chasing ducks. I mean jumping out into the air, letting gravity take hold, accelerating down 4-5 feet and slamming all that mass into the ice and taking off at warp 3.... Scarred the bejeepers out of us!!! The ducks too!!! She's one it 2 days in a row now, higher the second day. Little monster. thanx for your replies so far....its very helpful...gives me an idea of what weight range he could be. I find he's perfect now, 41 lbs approx....or a bit much since the last time we took his weight. I just find he grew wayyyyyyyyyyy too fast since we got him at 6 weeks old. Hopefully he's gonna stay for this for a while, so we can enjoy his "babyness"
Max and Zeena are both AKC registered purebreds. Max is reaching 3 years old at 75 lbs.plus? It's hard to pick him up, he's a load. Zeena just turned 2 and she is 60 lbs. They have the same father, different mothers. Max is about 20 lbs. heavier than his father. The breeder freaked out when I brought him over to his house. Max was one year old then and he was bigger than all their Chows by far. My current two chows are little ones, Firesong weighs about 40lbs, Dreamdancer about 43.5lbs, Firesong is just right for her bone structure, I'd like to get Dreamdancer up to about 45-48lbs but I think it's impossible he's just too busy. Darkwind was my heaviest boy at 72lbs my other males were between 57 and 62 lbs each. 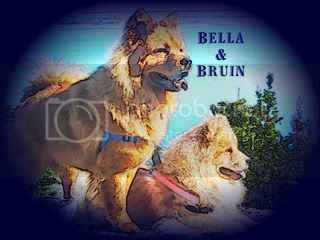 It really depends on their genes, chows have such a wide range of weights depending on their bone structure, the lighter boned, longer legged ones are of course lighter in the 40-60lb range while the heavier boned ones with the shorter legs seem to run from 55-80+lbs. 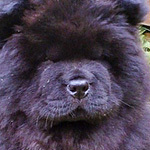 All my chows have been the longer legged, open faced ones that look a lot like the older type of chow. And yes they do grow up very fast at 18 months a dog is pretty much adult weight and height, there is still some inner growing they do, many of the males will continue to fill out, (develope deeper more muscular chests) until they are about 3 years old. This is why they should never be bred until after 2 years of age so that their joints are finished growing and they can be tested properly. Lily is 36 pounds now at 4 and a half. She does not have much fur at the moment and looks really skinny to me, but the vet assures me she has excellent weight for her structure. She was 33 pounds for the longest time. I really fretted then. I could not get any weight on her, and didn't want to over feed and chance a bloat. Our puppy is almost six months old and he is around 35 pounds. He was 27 lbs at 4 months old. Sweetie is 2 years old and normally weighs in somewhere between 50 and 52 lbs. Pong is a really cute puppy by the way! 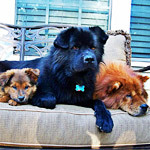 I've had 4 chows and they have all weighed in around 50 lbs as adults. I love the size... just big enough to romp and play but not too big for me to handle. wow....i must admit, 50lbs would be great for me also....i already have a hard time controlling pong when we go outside, and hes around 41 lbs. 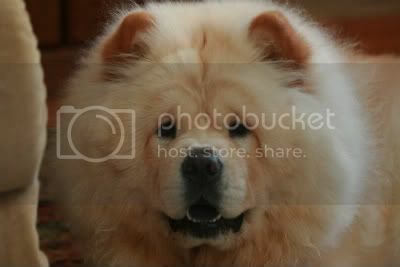 Molly is a purebred, open faced chow. She is usually between 46 to 50 pounds. Lobis Cunami is 1 year old and weighs 56 lbs. Teddy weighs 46 lbs I think. 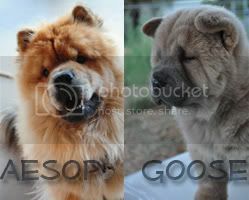 We have to purebred chows..
Bella is 2 years old and she weighs 38.5 lbs (she is a very small girl). When she was Pongs age she weighed between 25 and 30 lbs. Our boy, Bruin, is 1 year old. He currently weighs 55 lbs. When he was 5 months old, he weighed just under 40 lbs. last years weigh in at 2 yrs was 56 lbs. Nikki turned 3 in Nov.(don't have her weigh in sheet close by). and she may have gained 1 lb. or 2 but we won't tell her that. She thinks she still has her girly figure. LOL She hasn't been too active lately with the snow so not burning off but still consuming. Oh, my that sounds familar..
Bramble is 17 months and weighs 54lbs. She is not fat and is quite small only just reaching the minimum breed standard size of 18" she may be just under. all your babies are so adorable and unique, it's amazing how different each chow looks!!!! 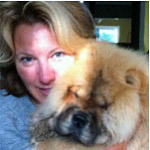 As I was reading everyone's entries I realized my chow Little Bear (pure bred with CKC smooth coated chow) is BIG!!! She weighs about 65 lbs!! She isn't overweight either... just solid muscle!! Maybe I should change her name to Big Bear! Colonel weighs around 48 lbs. The secret to his trim physic... He watches his weight, eats only good stuff and works out. "Colonel weighs around 48 lbs. The secret to his trim physic... He watches his weight, eats only good stuff and works out."